Sorry for the tardiness of this post. This week we have another guest post from Jonathan in part 2 of The Artwork of The Hackers Guild. Welcome back for another production art post! This week I wanted to discuss the process from the first sketch to Kickstarter. When I started the process I began with series of rough sketches to build up a number of ideas for each character. I wanted each of the characters to be different, and have a unique look that says a lot about their character. Once we were happy with the base look I continued to render each character portrait to a high quality for Web and print. Once the characters were finished, I continued with the box art, and game artwork. I wanted to go with a more high tech look to complement the hacking and advanced technology themes of the story. I wanted to hint at the tone of the game through the styling, and as we got closer to the Kickstarter launch, I took a bit of time to rethink the box art, and thought it’d be interesting to put the protagonist front and center, however only showing the lower half of her face to add some mystery to the character. For the Kickstarter Campaign I produced a short video based on the direction and script by Raymond Northcott. This was a fun video to produce, and as we were developing it, I felt like the video needed some more artwork to show off some more story elements. This helped to show some more of the world of The Hackers Guild, a world thrown into chaos because of the global government. Once the video and campaign artwork was ready, we launch the campaign. We received so many kind words of support for both the game and the artwork, and even though we didn’t reach our goal, I was incredibly delighted with the response and could appreciate the feedback more as we’re taking it all on board for the latest iteration of the game. 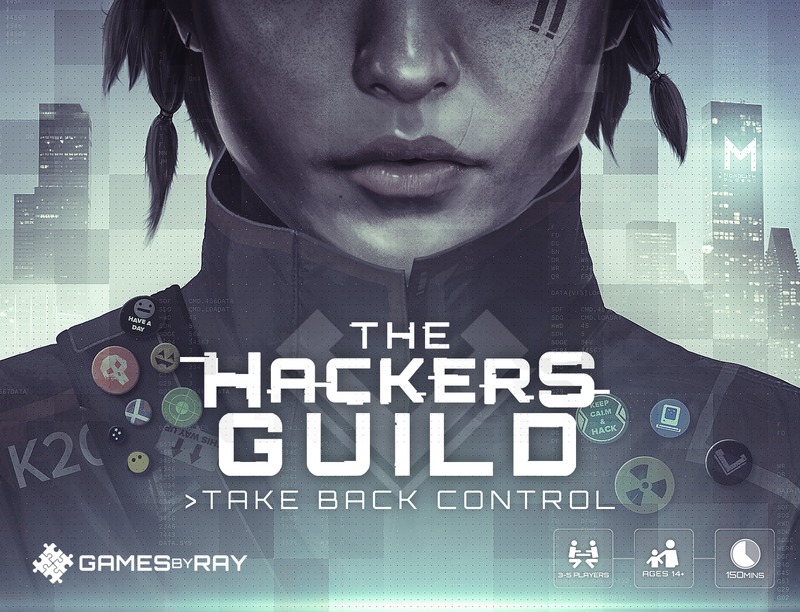 When we return, you’ll receive the first glimpse of the new Hackers Guild. I can’t wait to show you how it’s evolved and hope you will enjoy the changes. Thanks for joining us again and I look forward to sharing more. That’s it for this week. Until next time, happy designing.